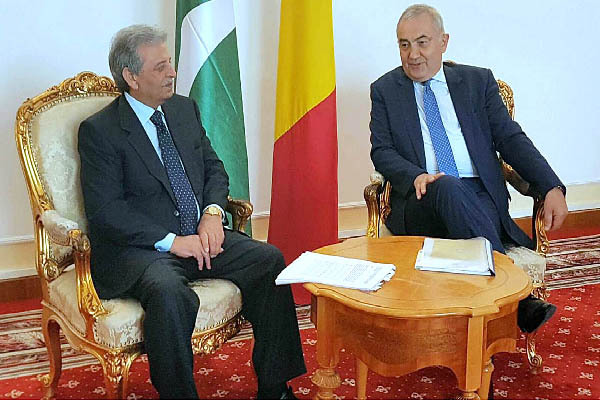 ISLAMABAD, Aug 24 (APP): Pakistan and Romania on Wednesday agreed to benefit from each other’s expertise in the fields of Oil & Gas and Science & Technology. Both the countries reached at a mutual agreement at meeting between Pakistan delegation led by Minister for Defence Production Rana Tanveer Hussain and Romanian side by Foreign Minister Lazar Comanescu, held at the Ministry of Foreign Affairs, Bucharest. According to a message received here, the two sides expressed satisfaction over the positive trajectory of relations between the two countries and discussed various issues of mutual interest including trade, investment, defence production and science and technology and people to people contact. They agreed on the need for strengthening cooperation between the two countries in these areas. Further it was stressed that both countries should benefit from each other’s expertise in various fields especially in the fields of oil and gas and defence production. The Minister for Defence Production emphasized the importance Pakistan attached to its friendly relations with Romania and underlined the need to hold regular high level exchanges. The Foreign Minister of Romania appreciated Pakistan’s efforts as a front line state in the war against terrorism. He also underscored the importance of signing bilateral agreement between the two foreign ministries by the end of 2016.